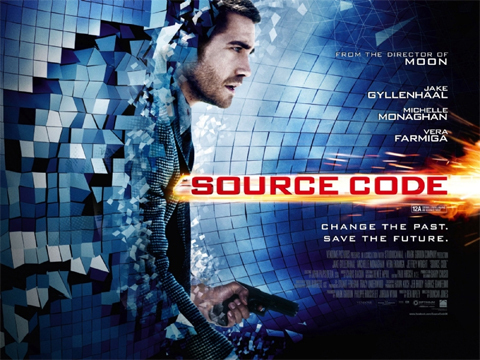 Source Code is a very specific kind of Science Fiction that toys with a single concept like a cat toying with it’s pray. That concept becomes what that the whole story is built around. It’s the nature this kind of Science Fiction that it is often more about a piece of technology or a plot than about characters. In this case it is the plot and two mysteries that is the focus. Hopefully you’ve already seen the trailer so I don’t need to explain that (I’ve posted it above if you haven’t). Each time we go through the eight minutes before the attack again more parts of the mysteries is revealed. Each time we jump back to the real world some parts of the mysteries are revealed. Until we get to the end of the ride after 93 minutes. The concept at the core of Source Code’s plot is a loop in time of sorts in which one person assumes another person’s identity for a short period of time before a disastrous event. It would be easy to point to Ground Hog Day with Phil’s romance with Rita; or if you prefer to focus on the occupying someone else’s life trying to put something right its Quantum Leap; or a military project using short-term time travel to fix something that’s gone wrong Seven Days; and anyone who watched Star Trek: The Next Generation could easily point to the episode Cause and Effect with the Enterprise blowing up repeatedly after a sequence of events. If this was a film without its own twists and play on the idea that would be fair but fortunately this film is its own take on those ideas. The characters are nicely acted within the confines the structure gives them to develop but inevitably they are largely stereotypes: so inside the source code we have an air force pilot, a stand up comedian with a drink problem, a non descript terrorist and other passenger while outside we have the Bureaucratic Scientist, the military superior and the boffin who operates the machine. At least once the hero details off the Christina’s main characteristics he has identified in his various runs through their eight minutes together. The plot relies on a series of twists and the parallel plots in the Source Code world and Real World to keep the tension level up. I have to congratulate the trailer makers because it would have been very easy to give away the first twist in the trailer. It would also have been quite easy to lose the films pace in an explanation of how time travel really worked – a few lines of appropriate technobable cover up that crack and leave it to the audience to fill in the blanks if they care. If this was British Science Fiction I’d predict a more down beat twist for the ending. However the ending was still satisfying. I’m pretty certain it was foreshadowed earlier in the film but I’d have to watch it again to be sure. The effects, action sequences and stunt work are all solid. I can’t honestly remember anything about the soundtrack although I’m sure there was one solidly contributing to the film. Ultimately Source Code is a good, solid movie in all departments although I’m not sure how much rewatch value it will have on DVD.